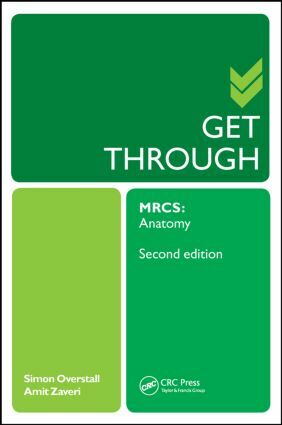 Fully revised and updated in light of the changes to the format of the MRCS examination, this second edition of Get Through MRCS: Anatomy provides candidates with the knowledge and practice necessary for excelling at the challenging MRCS part B OSCE examination. Written by the experienced author of the highly successful first edition, Simon Overstall has extensive knowledge of the exam, both in teaching offline courses and authoring MRCS revision texts. Get Through MRCS: Anatomy is essential reading for MRCS candidates wanting to achieve expert anatomical knowledge and to ultimately earn high results within their postgraduate examinations. Simon Overstall MB BS MRCS, Locum Consultant Plastic Surgeon, East Grinstead, West Sussex. Amit Zaveri MB BS (Lond) BSc (Hons) MRCS (Eng), Plastic Surgery CT2 (Core Surgical Trainee) at Queen Victoria Hospital, East Grinstead, West Sussex.